As a small-island middle-income country, Cape Verde is seeking closer ties with mainland African countries to sustain economic growth and development (Daily Graphic, 2017; ECOWAS, 2017). And beyond Africa, Cape Verde is tapping into the economic ambitions of China for investment and technical assistance, especially in the “blue economy” of the country's abundant maritime sector (Vreÿ, 2017; Addamah, 2017). How do ordinary Cape Verdeans feel about their country becoming more closely entwined with mainland neighbours and China? Findings from Afrobarometer’s Round 6 (2014) survey suggest that Cape Verdeans value the contributions of the Economic Community of West African States (ECOWAS) and the African Union (AU) but are divided in their views on free cross-border movement of people and goods. 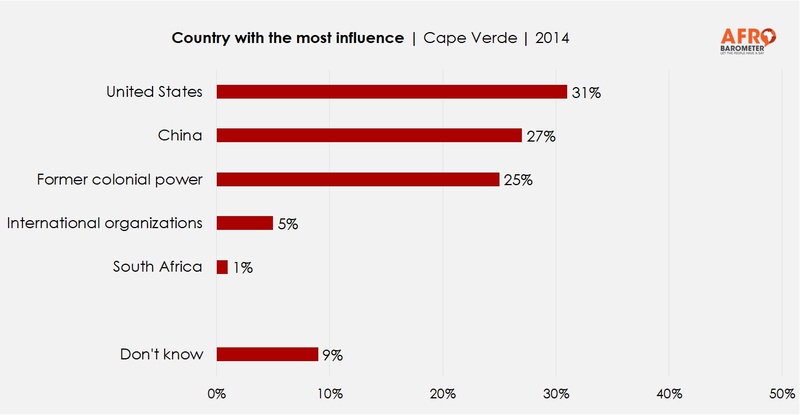 The United States is the most popular model for Cape Verde’s development, but China is widely perceived as exerting a significant and positive influence.